The FFB works in partnership with the Basque Baltistan Fundazioa (BF), an NGO for international cooperation. Together the organisations work for the development of the indigenous communities of the Hushe Valley, financing projects in Education, Agriculture, Ecotourism, Infrastructure, Health, Gender Equality and more. The origins of the BF and FFB lie in the friendships developed between Basque mountaineers and their Balti guides and porters. In 1999, the brothers Felix and Alberto Iñurrategi, together with Jose Carlos Tamayo and Jon Lazkano, were rewarded by the Basque Government for the rescue of a seriously injured South American climber on Nanga Parbat. They donated the reward to the Green Mountain Climbing School in the Hushe village of Machulo, a training centre established in 1995. The centre aims to enhance the mountain skills of the local people, enabling them to provide a better future for their families. Following the death of Felix Iñurrategi on Gasherbrum II in 2000, the name of the school was changed to the Felix Iñurrategi Climbing School and in 2001 the Baltistan Fundazioa was set up to provide financial support. The BF's involvement in the region grew rapidly with the building of a guest house for tourists in Machulo, promoting tourism and bringing money to the area. A much needed lift irrigation system was installed in Machulo and clean water supplies were established for the nearby villages of Saling and Balygone. Projects were established to enhance agricultural efficiency; vegetables became available during the winter and the apricot harvest, the area's main export product, was significantly improved. Since 2005 the FFB has focussed increasingly on education in the area, and especially on providing education for the female population. 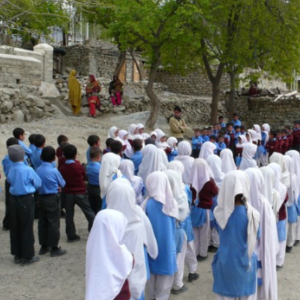 The Munawar School was built in 2005 and later expanded in cooperation with the Education Department of Baltistan. The FFB team is currently in a phase of training and strengthening the management and administrative skills of the local people, most of whom are without education or training. The belief that it is possible to build a better community, a more just and dignified one with a higher standard of living, encourages everyone to strive and work for the community. The inhabitants of the Hushe Valley have suffered for centuries from the paternalistic attitude of the country, which discounts the abilities of the local community. The philosophy of FFB is that it is essential that interest in the development of skills and improvement of the position of the inhabitants of the valley is local and associative in structure. All projects must be based on shared responsibility, mutual understanding and partnership. The Foundation has promoted the participation and leadership of the Community in all activities and projects through the creation of subcommittees under the direction of the Committee of Village Notables (Elders), who lead the projects in cooperation with the Board. Since the Foundation was established in 2001, its clear objective has been to equip the people in the area with the skills and infrastructure necessary to promote and manage their own mode of sustainable and objective economic development, for both men and women. Human and professional training is, therefore, one of the pillars of the Foundation. It is the key to the socio-economic development of the population and also a tool for the empowerment of women in the valley. The FFB aims to be a leading and widely accepted developmental institution, particularly in the fields of Education, Agriculture, Eco-Tourism, Water Resources, Energy Resources, Skills Development and Womenï¿½s Empowerment. Positively influencing the socio-economic conditions of Gilgit-Baltistan and in particular the Hushe Valley, in ways that promote peace, harmony, unity and prosperity. By valuing and supporting collaboration and embodying pluralism, we will offer innovative and dynamic indigenistic programs that are academically, socially, culturally and economically excellent. The FFB is a non profit organisation, seeking to improve the welfare of the people of the Hushe Valley, leading our community to a Human, Sustainable and Participatory Development. We aim to work in partnership with international organizations, government organisations and local organisations, to build local capacity and develop assessment and evaluation procedures in order to improve practices and identify what works and why. In our relationships with our colleagues, we aim to be open, supportive, reconciliatory, tolerant, generous, and trustworthy. We aim to be supportive and flexible, to provide a mentoring environment, to respect pluralism, and to promote equity and equality. In our relationships with our partners, we aim to be trustworthy, collaborative, empowering, and supportive, accommodating needs and diverse perspectives. We seek to reinforce the positive self-images of all concerned and be valued because of our developmental expertise. In our commercial relationships, we aim to be absolutely reliable and even-handed at all times.